#1 best-selling Environmental Science text and media package is now even better! 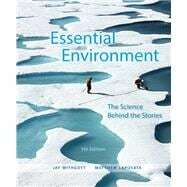 Essential Environment: The Science behind the Stories, Fifth Edition engages students using current, integrated case studies that provide a context for understanding science and environmental concerns in a brief, 18-chapter text. Jay Withgott and Matt Laposata present the latest understanding of environmental science along with expanded FAQ discussions that address common student misconceptions and with new Data Analysis questions that build quantitative literacy. MasteringEnvironmentalScience ® with eText is an online homework, tutorial, and assessment product that improves results by helping students quickly master concepts both in and outside the classroom. MasteringEnvironmentalScience incorporates activities written by the authors, so your students will arrive better prepared for class. The book and MasteringEnvironmentalScience work together to create a classroom experience that makes teaching and learning more efficient and enjoyable. Note: If you are purchasing the standalone text or electronic version, MasteringEnvironmentalScience does not come automatically packaged with the text. To purchase MasteringEnvironmentalScience please visit www.masteringenvironmentalscience.com or you can purchase a package of the physical text + MasteringEnvironmentalScience by searching for 0321984455 / 9780321984456. MasteringEnvironmentalScience is not a self-paced technology and should only be purchased when required by an instructor. Jay H. Withgott has authored Essential Environment and its parent volume, Environment: The Science behind the Stories, since their inception. In dedicating himself to these books, he works to keep abreast of a diverse and rapidly changing field and continually seeks to develop new and better ways to help today’s students learn environmental science. As a researcher, Jay has published papers in ecology, evolution, animal behavior, and conservation biology in journals ranging from Evolution to Proceedings of the National Academy of Sciences. As an instructor, he has taught university lab courses in ecology and other disciplines. As a science writer, Jay has authored articles for journals and magazines including Science, New Scientist, BioScience, Smithsonian, and Natural History. By combining his scientific training with prior experience as a newspaper reporter and editor, he strives to make science accessible and engaging for general audiences. Jay holds degrees from Yale University, the University of Arkansas, and the University of Arizona. Jay lives with his wife, biologist Susan Masta, in Portland, Oregon. Matthew M. Laposata is a professor of environmental science at Kennesaw State University (KSU). He holds a bachelor's degree in biology education from Indiana University of Pennsylvania, a masters in biology from Bowling Green State University, and a doctorate in ecology from The Pennsylvania State University. Matt is the coordinator of KSU's two-semester, general education science sequence Science, Society, and the Environment which enrolls roughly 7,000 students a year. He focuses exclusively on introductory environmental science courses, and has enjoyed teaching and interacting with thousands of non-science majors during his career. He is an active scholar in environmental science education and has received grants from state, federal, and private sources to develop and evaluate innovative curricular materials. His scholarly work has received numerous awards, including the Georgia Board of Regents' highest award for the Scholarship of Teaching and Learning. He resides in suburban Atlanta with his wife Lisa, and children Lauren, Cameron, and Saffron.